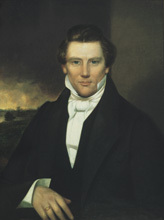 "He [Moroni] called me by name, and said unto me that he was a messenger sent from the presence of God to me, and that his name was Moroni; that God had a work for me to do; and that my name should be had for good and evil among all nations, kindreds, and tongues, or that it should be both good and evil spoken of among all people." Today, in December 2005, his name is both revered and cursed. Current world wide membership in the church he organized stands at 12.2 Million and growing. "An acquaintance said to me one day: "I admire your church very much. I think I could accept everything about it—except Joseph Smith." To which I responded: "That statement is a contradiction. If you accept the revelation, you must accept the revelator." In my own experiences in talking to people I have had the same responses. People like almost everything about my faith with the exceptions being the Book of Mormon and Joseph Smith. It is a wonder to me, as well, that our faith can be so praised and yet our very foundation decried. Twice In the past year I have stood in the room where Joseph and his brother Hyrum were killed. Each time I have felt that I stood on sacred ground. I add my voice to those who honor the man, Joseph.